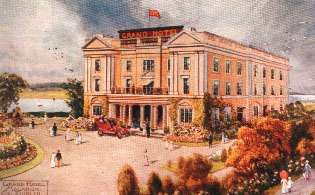 The Grand Hotel was built in 1835 by Mr. James Fagan of Feltrim. He was a member of the British Parliament and when his Malahide Hotel was granted a royal warrant he decided to call it the 'Royal Hotel'. His motivation for building the hotel was obviously influenced by the impending arrival of the railway in Malahide. 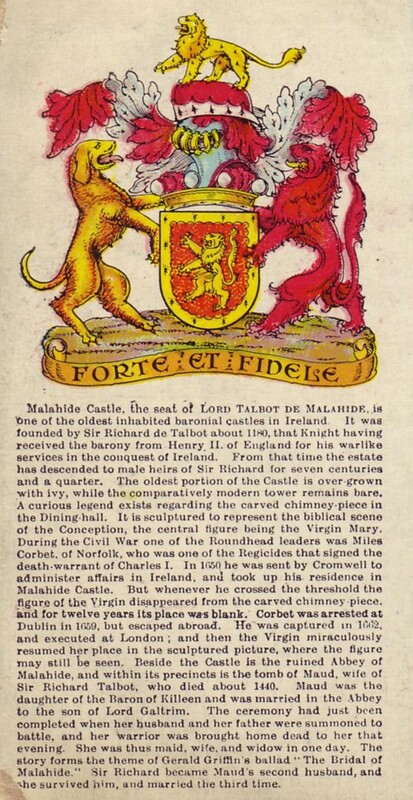 With the awakening of Irish nationalism in the early 1900's, the name was changed to the 'Grand Hotel'. The Grand Hotel has had a distinctive and colourful variety of owners over the years. One such owner - Dr. John Fallon Sidney Colohan - bought the Grand Hotel in 1910 for £10,000, painted the hotel pink to celebrate his favourite drink, Pink Champagne, of which he consumed a hefty daily supply. Dr. Colohan was a pioneer of motoring in Ireland importing the first petrol car in 1898. 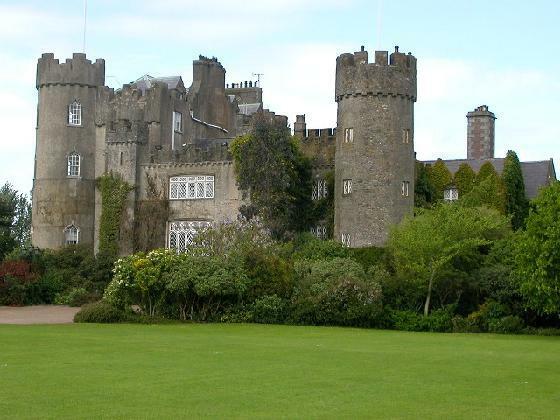 The advent of the railway in Malahide heralded big business for the sleepy seaside village of Malahide. 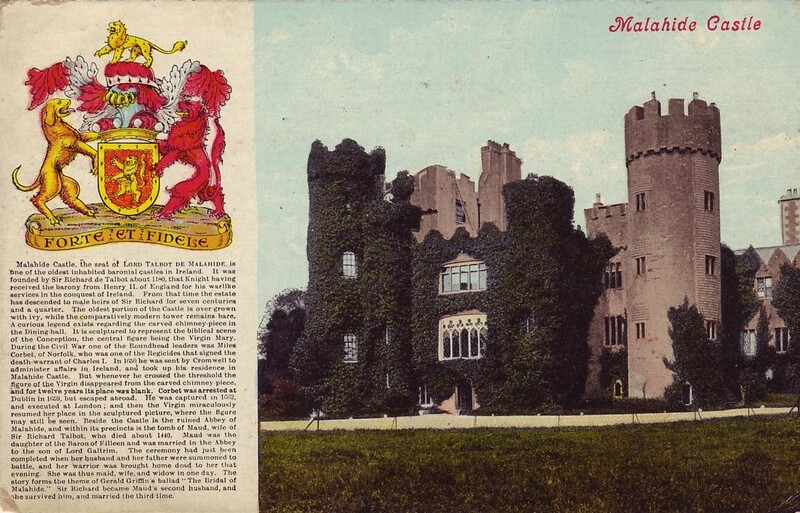 The Grand Hotel offered special combined railway and hotel tickets, an inclusive fare of sixty-three shillings covered travel between Malahide and Dublin and lodgings at the Grand for a week. A major attraction for many years in the hotel was the famous 'Malahide Baths' which were situated at the rear of the hotel. The First World War disrupted the Grand Hotel's tourist business for a period of time as the hotel was chosen as the Irish headquarters for the British Army in the event of a German invasion. After the Second World War, business picked up again and the discerning visitor came to admire the best sunsets on the East Coast of Ireland. 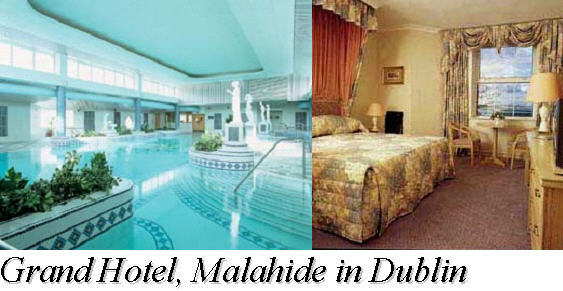 Postcards of the hotel quoted Malahide ''A town noted for its ideal compromise between city and country''. In the latter half of the 20th century the Grand Hotel was re-constructed and modernised and was officially re-opened by the Attorney General Mr. P. McGilligan T.D. in 1955. The sixties saw the Grand Hotel in the possession of Luke and Yvonne McCabe who also conducted a successful riding school from the Hotel grounds. In 1974 Matt Ryan became the next owner of the Hotel. During the present ownership of the Ryan family the Hotel has expanded from having 12 staff to nearly 200. Development and improvement work started immediately and continues to this day. In 1982 a large conference centre was built, and in subsequent years 100 bedrooms, the Colonnade restaurant, new Reception area, Ryan's Bar and a superior Business meeting centre were added. The Grand Hotel, splendidly perched beside the estuary and the bobbing clutter of small boats, remains a marvellous place to relax and do business.